September 20, 2011 By This post may contain affiliate links. 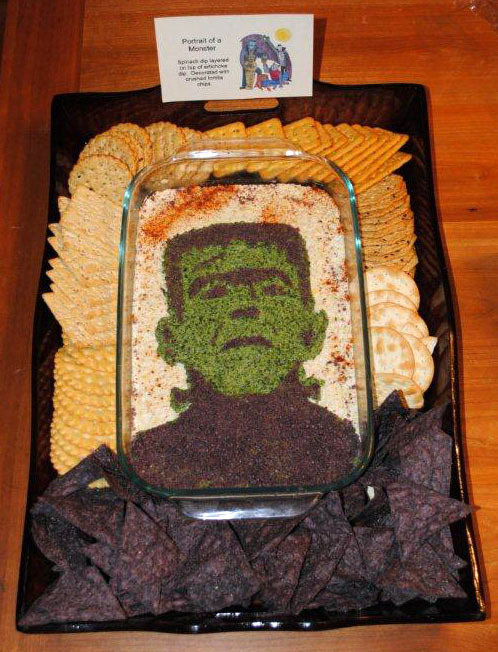 A good dip is a must have at any party, so make this Portrait of a Monster Dip! This spooky appetizer is so delicious and will have your party guests amazed at your cooking skills! 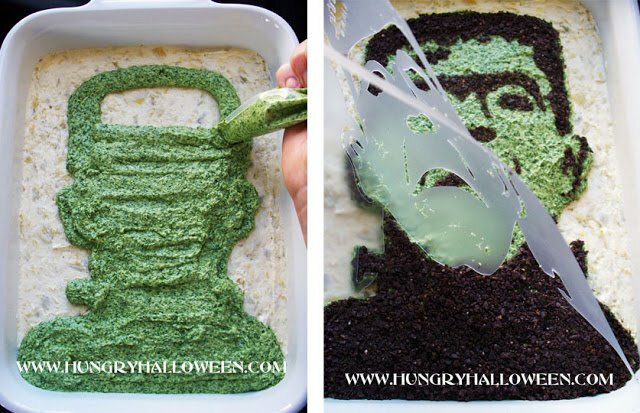 This is my absolute favorite recipe creation to date and it is the very first recipe you’ll find in my cookbook, Hungry Halloween, featuring Movie Monster Munchies, Bewitched Buffet, and Dead Man’s Diner. I have, and will, only share three recipes from my book on my Hungry Happenings blog. I want those of you that purchase my book to be excited when you find so many new and exciting recipes inside. As for this recipe, I love spinach and artichoke dip, and when I created this Portrait of a Monster, I decided to use elements from a typical recipe, but made separate layers of artichoke dip and spinach dip so that I’d have a plain off-white background and a bright green surface on which to make the monster’s face. 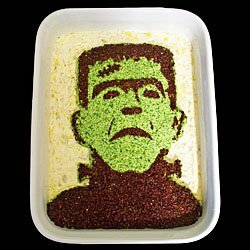 I crushed up some blue corn tortilla chips which usually look more black than blue, and sprinkled them over a stencil of Frankenstein’s monster. 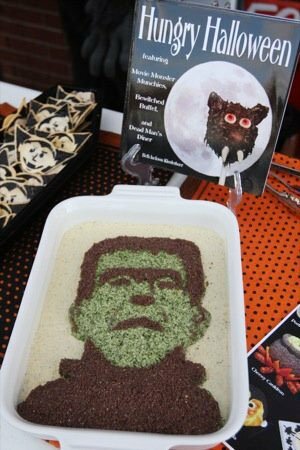 This dip was first served to the guests at my monster movie party in 2009, and it made quite a stir. At first no one wanted to disturb my work of art, so they ate just the artichoke dip background. About midway through the party one brave soul dug into the monster’s shoulder scooping up all three layers of artichoke dip, spinach dip and crushed tortillas and raved about the flavor. My other guests followed suit, and the monster was soon gobbled up. Last year, I had to make this dip a total of 7 times during the month of October for some classes I taught and a few book signing events. I have to say that I never tired of making it or eating it. It’s that good. *To roast garlic: Drizzle some olive oil over peeled garlic cloves. Loosely wrap in foil and roast in a 375 degree oven for 45 minutes. Remove from foil and let cool before using in your dips. 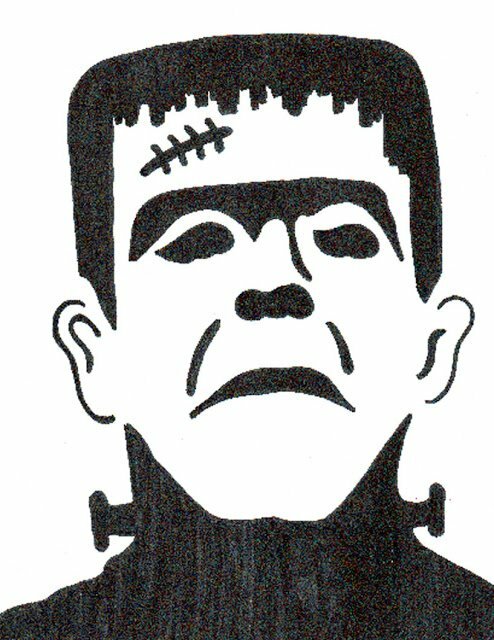 To Create the Monster Stencil: Click this link for a full size printable PDF file of the monster template. Print the monster template on an 8 1/2″ x 11″ paper. Set the printed template on a cutting board and lay a clear stencil sheet on top. Use a hobby knife or stencil cutter to cut out the black areas of the image. To make the artichoke dip: Drain the artichokes and squeeze them dry. Pour artichokes, roasted garlic cloves, cream cheese, mayonnaise and Parmesan cheese into the bowl of a food processor. Pulse until mixture is well combined. Spoon into a 9″ x 13″ baking pan. To make the spinach dip: Drain spinach by squeezing it in several layers of paper towels. Place spinach in the food processor bowl (you don’t even have to clean the bowl.) Add water chestnuts, cream cheese, sour cream, mayonnaise, Parmesan cheese, roasted garlic, salt, lemon juice, and onion powder. Pulse until creamy and smooth. To create Portrait of a Monster Dip: Spread the artichoke dip in an even layer in a 9” x 13” baking dish. Smooth out the top using an offset spatula or large spoon. Lay stencil on top of the artichoke dip. Use a sharp knife to trace around the outline of the monster’s head. Remove the stencil and wipe it clean. Spoon the spinach dip into a disposable pastry bag or heavy duty zip top bag and cut off tip of bag. Pipe the spinach dip over the artichoke dip within the lines left by the knife. Fill in the monster’s head with spinach dip, so his entire head is green. Pour blue corn tortilla chips into a clean bowl in the food processor. Pulse to fine crumbs. Lay stencil over top of spinach dip. Sprinkle ground tortilla chips over cut out areas on stencil. Clean off excess crumbs using a pastry brush. Gently lift off stencil. Refrigerate for at least 30 minutes or up to 2 days. Serve cold. You can also heat the dip up in the oven if you prefer, but I really like it cold and it will taste better throughout the party if it is served cold. The Portrait of a Monster dip in the picture at left was made for a book signing that I did last Halloween at Foy’s Halloween Store in Fairborn, Ohio. I got a lot of publicity in my hometown (a two page spread all about my book in the Dayton Daily News plus two more mentions, two television appearances on the local news, and articles in 6 local hometown newspapers) which helped bring lots of people out to my book signing events. It was so amazing to meet people who had already found my Hungry Halloween blog and were excited to get a signed copy of my book. I loved hearing from people who were planning to make my recipes for their parties. People were especially excited by the Portrait of a Monster Dip as I made it to sample at my book signing events and taught the recipe during a few Halloween cooking classes. I made it 7 times and never tired of making it or eating it. If you want to see the fun and exciting recipes in my Hungry Halloween cookbook, be sure to click on this Amazon.com link, to make your purchase. I really appreciate you using this link, as I get an extra commission for every book sold when you do. Thanks! 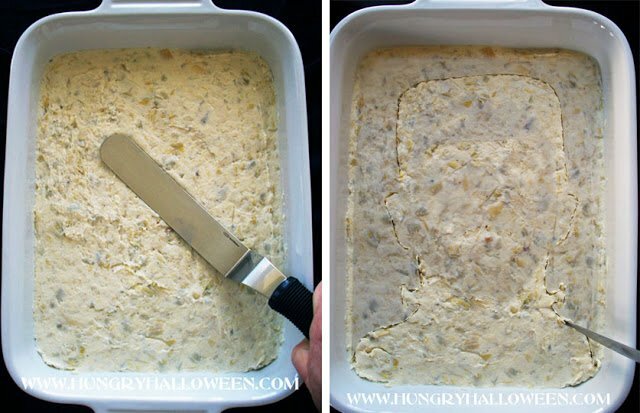 Update: I was so happy to find an e-mail from Darcy telling me that she made this recipe for her Halloween potluck last year and that it was a huge hit. Her monster looks amazing! Thanks for sharing Darcy. Previous Post: « Giveaway winner announced plus a re-cap of recipes for Halloween. He is so great! Congrats on your news coverage in your area. That was really nice of you to make him for the people! I bet they loved him! And he sounds so yummy, too. No way! How fun and creative. Totally sharing on Facebook. Thank you so much for linking up such a great idea. Karen @ It's the Suburbs or Bust- Yo! This is awesome, I just asked my husband if it reminded him of anyone. I would love it if you linked it to @ WorkShop Wednesday. Come link up! I love it! 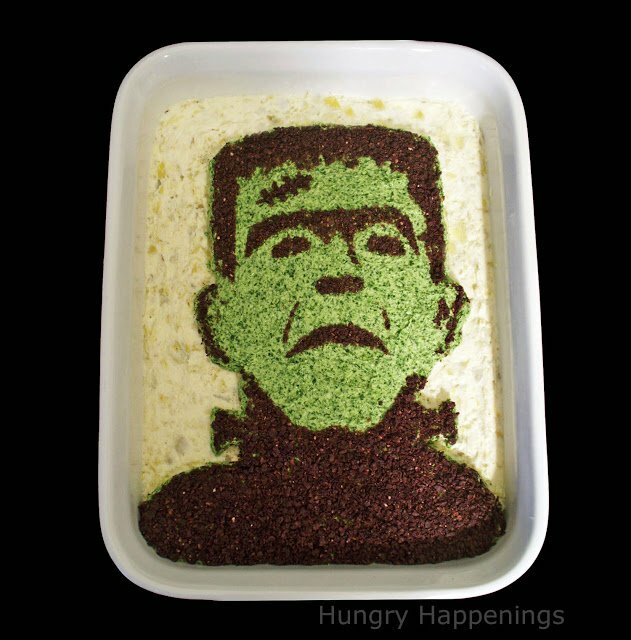 My son would be so fascinated with a Frankenstein dip. Hi I featured your Frankenstein this week @ WorkShop Wednesday! Thanks for linking to the party! Thanks everyone. So happy to see you like my monster too! Thanks also for all of the links to this post. I sure appreciate it. Great ideas for Halloween! i love it. Can wax paper be used for the template? I think you need something a bit more sturdy that wax paper for such an intricate design. If you do a simpler design then you could possibly use wax paper. has anyone tried this heated up? I would love to serve it heated but am afraid the spinach dip will melt and spread into the artichoke dip. Please advise. Thank you! I do think you could heat it up, but I’d probably heat in a low oven at about 250 degrees until it’s warm. That way the cheese in the dip will warm through but won’t melt and bubble up which could cause the spinach dip to spread. This dip recipe is great hot. I’ve made it many times for parties. Thanks! I warmed it and it was a success!! I also made the entire recipe VEGAN!! That is so great to hear! I’m so happy it worked out.